Beauty in the day: Boing-Boing Curls came into the clinic at her daily “scheduled” time. Her complaint was identical to the previous 7 or 8 afternoons, and I made my best attempt to get to the root of it all. 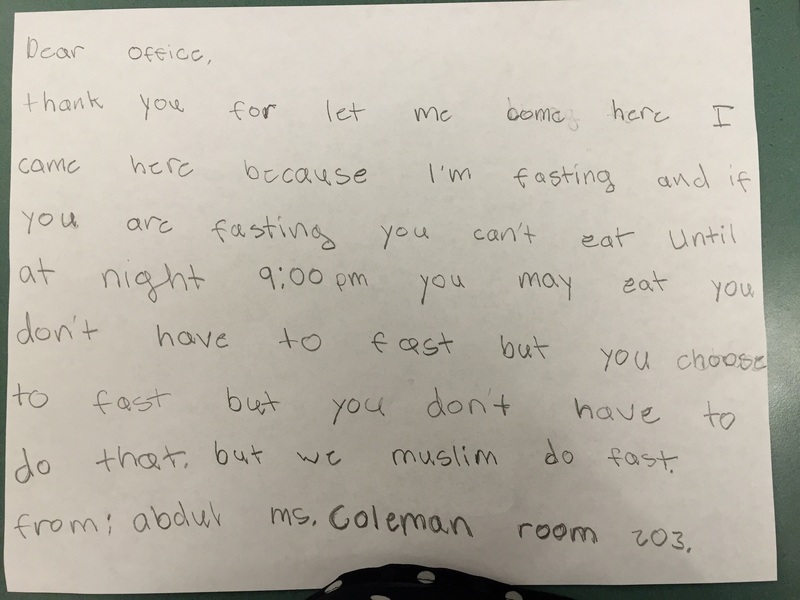 Beauty in the day: he came to the office, reporting that it was a fasting day for him, and maybe he could sit in the office while his classmates had lunch. Naturally it was okay, and I offered him a piece of paper and a pencil so he could draw. The school nurse asked him questions that gave him an opportunity to share about his fasting days. Sometime later, it was time for him to go. He approached my desk with the paper and pencil. Below is what he wrote, rather than drawing. Beauty in the day: today around 1:30 pm, the Lead Teacher at Summer School came whizzing past my desk, exclaiming in a very loud whisper, “Kelly! Come here! Hurry! You have to see this!” He led the way into the Workroom, and carefully dialed open the blinds to reveal one of our prior first grade friends who had transferred to another program, disembarked from his bus, sporting a long red cape, and thigh-high red Super-Hero boots. It was an adorable and heart-melting sight, eclipsed only by the even cuter behavior of the Lead Teacher, giggling with glee at the scene.